Milk Jug – Canadian style | Don't Dream: Do. This is a sweet invention. It’s a milk jug that you don’t have to wash out every day, or worry about the contents expiring without your knowledge. Plus you save the environment by reducing wasteful packaging. Instead of buying milk in cartons, Canadians can buy it in bags. These bags fit conveniently into stylish plastic milk jugs, all you do is cut the corner and pour. If I ever have to create a society – this is how you will drink milk. And there will be lots of lotte pies. 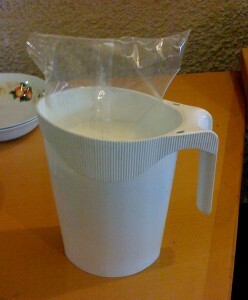 Update: “milk bags” are also everywhere in South America, though I never saw this type of jug being used or sold. The jug really makes the whole concept IMHO. I don’t get it. How do you reseal it? Or are you supposed to drink the entire bag of milk in one go every time?